Chariot has a dedicated high five button. You really don't need more reasons to buy this game than that. When I played Chariot for the first time at PAX Prime. I spent an hour playing with a stranger. By the end of our time, we were cheering each other on and getting along like old friends. They just don't make games like this anymore. At its core, Chariot is a game that's closer to the platformers of old than any other in recent memory. It dispenses with heavy narrative and superfluous features in favor of tight mechanics and well-designed levels, and it does so to great effect. Jumping and climbing through stages as either our blue-haired princess or her scruffy fiancée to pull the dead king to his final resting place in his coffin on wheels is entertaining and challenging. As you travel you'll need to collect treasure and fend off looters, all while listening to the king's ghost make snarky comments about his final accommodations. In many ways Chariot's mechanics remind me of great platformers from the 8- and 16-bit eras. It's been a long time since and old-fashioned run-and-jump has really captured that magic and it's alive and well here. Chariot is a fun game, without a doubt, but it's a game that's best enjoyed with a friend. The best time you'll have playing are the times you're emphatically, almost frustratedly telling your partner to help you pull a plan together, or when the two of you just key in on what to do without having to talk about it. Chariot is at its best when you can make your teamwork click. There's just something exciting about defeating the game's clever puzzles and exploring every nook and cranny of the game's large stages with someone in the same room. Gaming like this is a lost art, and while Chariot definitely could use an online option for those that just can't round someone up to play with, it's clear the game was designed with this in mind and it just works. It's been a while since I've played levels as well-designed as these. Chariot has a great difficulty curve to it. Early levels feel easy—almost too easy, even, but the difficulty gradually ramps up as you start to think about puzzles the way the game expects you to. Try skipping ahead a few levels (you can't usually, but I did this at PAX) and those lessons you didn't learn will hurt you. The length of the levels is also pretty decent, with each one taking about an average of 15 to 20 minutes if you explore things organically. They can definitely take a lot less or a lot longer depending on if you're playing alone, what items you bring with you and how well you work with your partner. Chariot's stages have a way of leading you along the right path without copious tutorials and over-explanations popping up all over the place to hand hold you through the level. It's a great throwback to the olden days where you dropped into the world and expected to know what to do. It feels good, and more games need to go back to platforming's roots. Between the dead kind providing occasional commentary and his skeletal servant offering up one-liners between levels, Chariot has some chuckle-worthy moments, but nothing is too memorable. Ultimately the dialogue on offer provides the right amount of entertainment—not often enough to be annoying, and not poorly written. Chariot is better for having dialogue to further reenforce the game's light mood, but it's not a huge addition to the quality of the game overall. 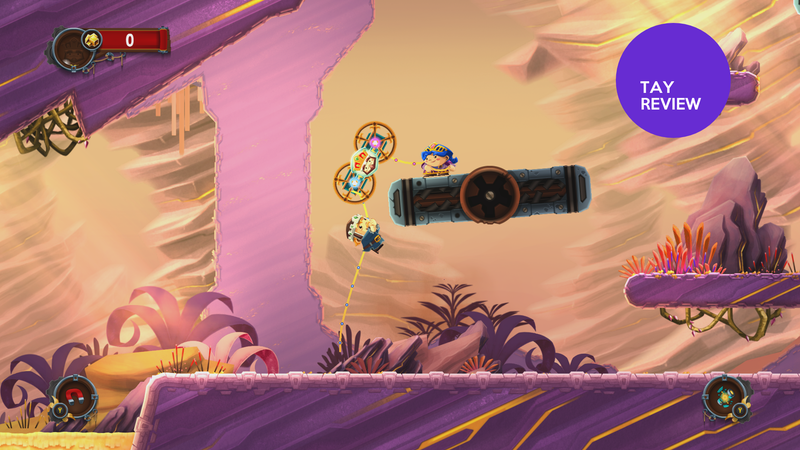 Chariot is a thoroughly enjoyable platformer. One without any crippling flaws, and one that is definitely far more enjoyable sitting next to a friend, the way it was intended to be played. I feel like there's an opportunity for online play here, but it also seems as though it'd run counter to what makes this game so great. Oh yeah, it's worth mentioning Chariot is free right now if you have Xbox Live Gold. Go out there and give it a shot, you'll be glad you did.